In a large microwave-safe bowl, heat the butter on high for 45 seconds. Swirl. Heat for an additional 45 seconds, or until melted. Stir the mini marshmallows into the butter. Then, microwave for 45 seconds. Stir well. Microwave for another 45 seconds. Stir. The marshmallows should be melted. In a large mixing bowl, pour all the Cheerios™. Drizzle with the marshmallow mixture. Stir to combine. Line a 9x13-inch baking dish with nonstick aluminum foil (alternately, line it with aluminum foil and grease well). Pour the Cheerios™ mixture into the pan, and with wet hands press down into one flat layer. 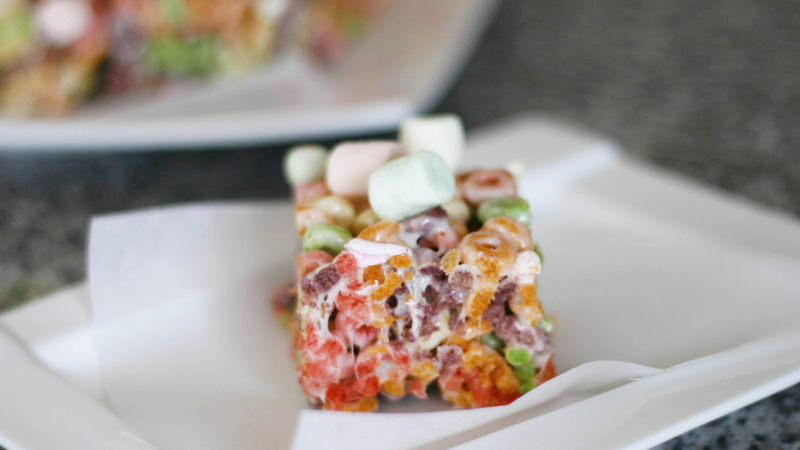 Sprinkle the multi-colored mini marshmallows on top and press down firmly to set. Allow the bars to harden for 30 minutes before cutting. These Super Fruity Bars are perfect! To some kids, if you put ‘super’ in front of anything, it becomes instantly stupendous. The other night, my son was having a rare moment of veggie resistance (he generally loves ‘em), but I convinced him to finish his veggies, telling him that they would give him super vision. He loved the idea of seeing through walls, and gobbled them right down. So, when I was thinking of a name for this recipe (which went through way too many iterations before today), I wanted something fun. Something that you’ll want to say. Something everyone will remember. Enter Super Fruity Bars. Super Fruity Bars are made with my son’s very favorite variety of Cheerios (or so he told me today): Fruity Cheerios. Like those fantabulous crispy treats that we all grew up with, these bars are held together with a marshmallow-butter concoction. And then they are sprinkled with the cutest pastel-hued mini marshmallows. Sure, these aren’t as good for you as, say, eating fruit. But look at them! They are bright and colorful and oh-so-fun. And besides, your kids (or friends or coworkers or whoever) will probably surprise you with big hugs. Well, mine did, at least.